I read your article on abeka material and you said you wouldn't recommend for the younger grades. I really want something that has a lesson plan laid out for me everyday. I don't know what to do now because you said in your article it was too much for the younger grades. My reply: Sorry to have discouraged you about using Abeka. I have just seen so many people burn out on it that I wanted to make sure that people understand what they get when they purchase Abeka. If your child really likes workbooks, then they might like Abeka. Don't get me wrong, there are plenty of people that like Abeka. But there are some that don't like it and wish that they had been warned before they purchased. I don't know what you have used in the past. Knowing that and a little more about you and your child would help me better know what to recommend. Some other options for you if you still want lesson plans would be Sonlight or if you want a cheaper workbook approach you could use Spectrum workbooks. 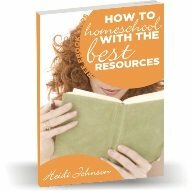 You might also look over some suggestions I have for the various homeschool subjects on my home school books page. Feel free to reply back if you need more information or ideas. I'd be glad to help you.